Material Safety Data Sheets (MSDS) are created to provide a product's physical and chemical characteristics. The MSDS purpose is to reveal and organize the data in a useful way for artists to better understand the materials. Our MSDS provides an unfitered view of our tattoo ink and addresses important issues which may include: hazardous ingredients, fire, explosion, reactivity, health hazard data, and precautions for safe handling and use. Some product questions may not be addressed in a MSDS sheet, but are still important issues to artists, clients and the general public. Because we are artists, we view our product the way an artist would view it. Their concerns are our concerns. The following items are answers to the questions that are important to the tattoo culture. Eternal Ink is made of natural pigments, deionized water and hamamelis water. Eternal Inks may sometimes have a mild scent! This is because we only use natural pigments and sometimes nature has a scent. We do not use additives to hide the occasional scent - it wouldn't be natural if we did. USAGE – Before using, tighten cap and shake the bottle vigorously for one minute after the mixing ball moves freely. Shake before each use. After use, close tightly and wipe the pouring tip with a clean cloth. 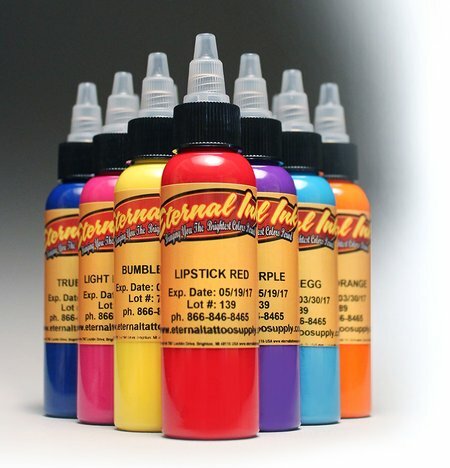 Should the tattoo ink begin drying out or need thinning, Eternal Ink recommends using our product, Keep It Wet. STORAGE – Each bottle of Eternal Ink is marked with an expiration date on the label. It is recommended that the ink be used before that date. In general, stored bottles should be shook every three months to ensure a consistent color match during active use. Eternal Ink should be stored out of direct UV sunlight at a comfortable room temperature. Do not freeze. We hope this answers any questions you have about Eternal Inks. If you have additional questions or require further information, please contact us and we will do our best to answer any questions. We can be reached at (866) 846-8465 or through our Contact Us page. Thank you for choosing and using Eternal Ink.